Everybody loves a good ghost story. Or, a vampire tale or a witches scare. Have any idea where the number one city in the United States is that you can find this all in one place? New Orleans of course! From local ghost and vampire tours to tea leaf readings and a look inside a real voodoo museum, good food and music is really just skimming the surface of what this famous old French city has to offer. And what better to get around town in New Orleans than the 2014 Lexus CT 200h. 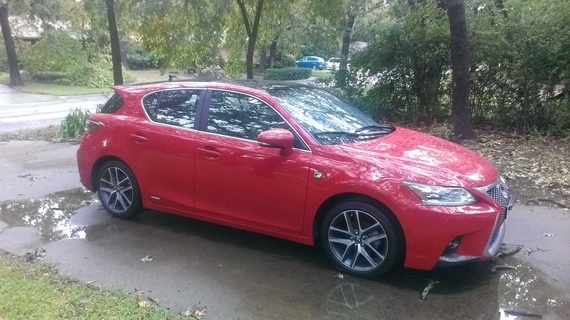 Indeed, I like reliable, I like sturdy and I certainly am a fan of Lexus so enter the 2014 Lexus CT 200h in the eye popping red I drove for a week and you have a distinctive hybrid vehicle that is as much about high-end as it is about sporty boasting the hatchback design. After all, in case I need to flee fast from those ghosts in the Big Easy, the Lexus is well equipped to sweep me away, and while it might not be the fastest car out of the gate, it does have some high marks with new additions that were added for 2014 like the styling in the front and new wheels and a cool package addition called the F Sport. Competition for this four-door hatchback includes the 2014 Ford C-Max Hybrid, Acura TSX Sport Wagon, BMW X1 sDrive28i and the Buick Verano Turbo. The 2014 Lexus CT 200h has four doors and seats five with only one trim level offered. There are also a few additional packages you can add like the Display Audio package with 10 speakers versus six, a rearview camera and a seven-inch display screen. There is a Navigation package, a Premium package and the new for 2014 F Sport package with 17-inch alloy wheels along with a sport-tuned suspension, larger rear spoiler and distinctive styling on both the interior and exterior. Under the hood, the 2014 Lexus CT 200 is a 1.8-liter four-cylinder gasoline engine with an electric motor/generators and a nickel-metal hydride battery pack. You get 134 horsepower with this combination utilizing front wheels with a continuously variable automatic transmission. For a hatchback, this is definitely a snazzy option and the interior won't disappoint with the premium vinyl upholstery that goes very well with the styling of this car and whether it's the gasoline engine or the all-electric power both are equally easy to manage with a price tag of coming in at $41,540. Now that you have your set of wheels intact, take note there are many amusements in New Orleans to discover too. Let's take a look at some of the haunted and spooky tales that are told throughout the Big Easy and remember it was in New Orleans where author Anne Rice penned her vampire novels so let's start there. A company called Haunted History Tours specializes in a number of spooky outings, but the vampire tour is sure to get your blood pumping for just $20 per person. The tour allows you to enter into the dark and mysterious world of the undead. You will also have the chance to learn about New Orleans' history and visit locations that have long been associated with the creatures of the night. Are there vampires in the French Quarter? You be the judge and while you're at it asked about the legend of the coffin girls too. New Orleans is deeply rooted in Catholicism and voodoo. But don't despair; a voodoo queen will not place a hex on you the moment you step foot in the city. In fact, the legendary voodoo queen of New Orleans died in 1881. But while she was alive, she was a force to be reckoned with according to many stories. Marie Laveau was one of the most famous names in New Orleans in the 1800s, and 19th century travelers always visited her before leaving the city. As for where the voodoo in New Orleans actually came from it began in the African kingdom of Dahomey. The primary god of voodoo is a snake, in most cases a large python. When the religion arrived in New Orleans, practitioners incorporated some Catholic rituals into the African religion. Soon statues of the Virgin Mary and pictures of saints adorned many a voodoo altar, but the voodoo religion bore no resemblance to Christianity. Laveau had a daughter of the same name and it was said that the two of them had all the police and politicians in their power while they lived in a little cottage on St. Ann Street. Their ability to "voodoo" at will frightened everyone during their reign, and no one wanted to be on their bad side. Tales were told of 20-foot pythons, mummified babies, skeletons and good and bad luck altars all being in Laveau's home on St. Ann. Today there is still evidence of how deeply rooted the voodoo tradition is in New Orleans. Take, for instance, the Voodoo Museum on Dumaine Street. For a small fee you can tour the museum and in the back room there are two large pythons that are used in modern day voodoo ceremonies. The museum also offers a tour of St. Louis Cemetery #1 for $19. On the tour you will learn voodoo recipes, curses and spells. More importantly, you learn a little history of this ancient and secret religion. I even learned a spell myself, how to make a wish (please note the instructions have been slightly altered to avoid defacing tombstones in the cemetery. In the past there were many red X's on the graves of New Orleans' legendary voodoo queen, but the graves and tombs have been cleaned up and the folks in New Orleans ask that people do not do anything to deface any graves in any cemetery ever. Unfortunately, many of the graves have also been robbed over the years too, another big no no and bad karma all around. However, in New Orleans where the graves are built above ground because of the high water table, it can be quite interesting to look into an empty tomb. During your cemetery tour, you will invariably visit the tomb of voodoo queen Marie Laveau. Even today you will find her tomb adorned with burnt candles, flowers and voodoo offerings. You might even see an actual voodoo ceremony. While there are many ghost stories that abound in New Orleans proper, it's a must to get out of town and visit two of the most very haunted plantations in the area both the Myrtles and Oak Alley Plantation. The Myrtles is a renowned haunted house listed by the federal government as one of only 10 authentic haunted houses in the country. The Myrtles is an antebellum mansion located in St. Francisville, La. It was named in 1796 after the lovely pink myrtle flower. I spent the night in the garden room in the back of the house and took a tour of the place. I felt as if I was in a crowded room when there were only a few of us on the tour. The fact that at least 10 people have died violent deaths at the Myrtles explains its haunted reputation. The first series of deaths was due to the owner of the Myrtles having an affair with one of his slaves. The slave's name was Chloe. Chloe lived on the plantation and after the owner tired of her, she decided to seek revenge. She poisoned his wife and two daughters with oleander flowers in their dessert one evening. The other slaves were furious at what Chloe had done and decided to take matters into their own hands instead of waiting for the law. They dragged Chloe down to the banks of the Mississippi River and hung her from a tree. After she was dead, they tossed her limp body into the water. Chloe is said to haunt the house along with the two young daughters. There are other ghosts there too. There's the French governess and the Confederate soldier who takes up residence in the green room during May and June every year. There is an old slave graveyard in the back of the house that is surely home to a few spirits still living there. I heard there has only been one séance allowed to take place in the house. While the psychic was in a trance, one hand of the grandfather clock flew off and into the room. The owner does allow guests to tape the ghosts. The best way to do that is leave a tape recorder running in an empty room. Between the unearthly noises caught on tape and some of the strange happenings, a visitor to the Myrtles can't help but wonder just how many ghosts really haunt this beautiful home. Oak Alley Plantation is another old mansion that is said to be haunted. A picture, taken by a visitor years ago purports to show one of the ghosts. The picture is said to be of a lady in a black dress. Others have claimed to see this same woman pacing the widow's walk or riding horseback underneath the massive oak trees. The trees are estimated to be at least a century older than the home itself. Oak Alley has gone through many owners since it was built in 1830. In 1925 it lay abandoned and boarded up for a time. Finally, a new owner redecorated the home and returned it to its original glory. In the city of New Orleans proper, a few of the most haunted sites include the Monteleone Hotel where you can stay in a haunted room or the Bourbon Orleans Hotel, which is also rumored to be haunted. Mystere Mansion and the Haunted Mortuary is a historic mansion operated for 80 years as a real mortuary and now offers some of the best in haunted tours and ghost hunting, call for prices as they vary depending on the season. If you have never had your tarot cards or tea leaves read, New Orleans is the place to do it. There are tarot card readers on just about every corner in the French Quarter, especially around Painter's Alley. They will give you a quick reading and usually direct you to a shop where you can pick up something for what ails you from Love Oil, Courting Powder, Controlling Powder, Boss Fix Powder or the all important gris gris bag said to keep evil spirits away. One real treat beyond the tarot readings will be finding your way to a tea leaf reading at the Bottom of the Cup Tearoom. Reading prices vary and are by appointment, but the place has been in business since 1929. The Bottom of the Cup Tearoom is known nationally for the its tea leaf readings and the woman who read my leaves came strangely close to some personal facts that she could not have known. If you do happen to be in New Orleans on Halloween stick around and take advantage of All Saints Day on November 1 as well. New Orleans is the only city in the United States to celebrate All Saints Day. It's a time when the locals visit the cemeteries in honor of the many saints recognized in the Catholic religion. Even better is that it is a family-oriented activity with beautiful candles being lit throughout the city's cemeteries. Otherwise, just keep your eyes open and see if you can find your own vampires, witches, voodoo practitioners or even a ghost or two walking the street of this historic, but vibrant city. NOTE: This author does not and will never take any money from any automotive brand or destination/restaurant/activity, etc. in exchange for coverage - the views are strictly the authors opinion.